« ! Happy 2014 ! Winter in this part of the world looks like autumn. We are having plenty of grey and rainy weather, typical autumn storms included: nevertheless, I feel like hibernating and cocooning. Cold after cold and seasonal traditions also remind me of the essence of winter. This is the time to reflect, to dream of and plan the -amazing- year lying ahead, to indulge oneself with delightful teas and colourful, energizing food, to sit on the sofa under a cosy and colourful blanket, surrounded by candles, listening to the sounds of wintery nature and wearing layers and layers of warm and comfy clothes. What else is better than reading a book then? As we are in the third week of 2014 and as I realized I almost finished my third book, I have a new challenge for myself. This year, I’ll try to read one book a week and I’ll share the journey with you. For me, reading is like traveling and the world is a book. That’s -only one of the reasons- why ‘move’ is my word for 2014: I’d love to explore as many places as possible this year and to get to know more people from all over the world, by both reading and traveling. We spent last weekend in the Netherlands and some hours in one of my favourite bookshops in Germany as well and my collection of books expanded significantly. This lady feels one happy lady when she can combine both her love for books and the thrill of new places: I’d never leave a place or a country without having visited at least one of its bookshops. The huge pile of books I recenly bought will remain a secret for you, my dear audience, until I’ll have read them. For now, I’ll only be sharing the ones I read during the last couple of weeks. Week 1: ‘Das Glücksburo’ by Andreas Izquierdo. The book was a gift from Lily from The Red Notebook (thank you so much, dear friend) and I not only loved every single page and the way this book warmed my heart, I also was very surprised by the plot that I never could have imagined. It left me speechless and kept me awake for some hours after I finished the book, it made me extra aware of the beauty and uniqueness of every single moment we have in this life and of the incomparable worth of Love with a capital L. Das Glücksbüro also has its proper website. If you’d want to read some reviews, please have a look here and here. Week 2: ‘Grace. Een memoir’ by Grace Coddington, the Dutch translation of the original ‘Grace. A memoir’. As some of you already know, I love people and I can get very fascinated by their stories. That’s why connecting with people almost feels like a hobby to me and I’d never let a chance go by to have a talk with someone: from small talk with people on the bus or while having a walk in nature to hours and hours of talking with and listening to people, sharing about their lives, loves, strengths and weaknesses, adventures, visions, goals, beliefs and -above all- passions. As this is not always possible -because some people I admire already passed away, live too far away, have to busy lives or are too famous to have personal contact with, I very often read interviews, memoirs and biographies. The passion for this sort of reading already started when I was at primary school and I still have tons and tons of articles in my personal archives. During those days, classical music and words were my biggest passions and I got to know details and details of the lives of the composers I admired. How I dreamt of leading a life in Vienna, Salzburg or Paris … Back to ‘Grace. Een memoir’ now: I am not really into fashion, but those days I tend to read a lot about creative people, in a very broad sense of the word. It was a delight to get a glimpse into the world of the red-haired creative director of Vogue: I guess many of you remember her from The September Issue. She shares authentically about her career in London and New York, her work for Vogue and Klein,weeks and weeks of traveling all over the world, the combination work-relationship etc. etc. Her admirable dedication to fashion, how she writes about the many connections she has thanks to her job and her cute, original, very detailed, stylish and -more than once- humoristic illustrations spoke to me in particular. If you’d want to know how other people liked this book, you could have a look here and/or here. Week 3: ‘My Berlin Kitchen. A Love Story, with Recipes’ by Luisa Weiss. To be honest: as the third week has one and a half day left, I am still reading the book. As we were away, I didn’t have as much time during the weekend as I thought to have. Nevertheless, being more than halfway, I already can say that this book is one of my favourite books ever as it reads like music. Thank you so much, dearest Stephanie, for recommending it in one of your last courses and using it in your actual one as well. Thank you so much, dearest cousin, as I felt really grateful to get it as a birthday present. In a certain way, Luisa Weiss’s memoir makes me think of Pia Jane Bijkerk‘s ‘my heart wanders‘ which I also loved to the deepest and recommended some of my dearest people. Both are related to ‘move’, my word of the year. Daring and showing the bravery to take a leap, the importance of and the longing for a sense of belonging, how food can (re)create the feeling of home, authentic writing and sharing and what one does for love are only some of the themes and some of the reasons why I like both Weiss’s and Bijkerk’s books so much. Where ‘My Berlin Kitchen’ mainly plays in New York, Paris and Berlin, Bijkerk writes about Australia, Paris and Amsterdam. Both women illustrate their lifestyle in a different way, alongside their words: Weiss by sharing easy-to-make, mouthwatering recipes, Bijkerk by seducing your senses with her unique photography. For the German-speaking among you, I do have some good news: a German translation from the original English version of Weiss’s book is available since last November: ‘My Berlin Kitchen. Eine Liebesgeschichte’. It was really tempting to buy the German version as well in Mayersche, but for now, I’ll concentrate on the next 49 books I am planning to read this year and I’ll postpone a reading of the German translation until next year, when I hope to have visited both Paris and Berlin for the first time in my 34 year young life. If you’d want to read other people’s opinions on Weiss’s book, please have a look here and here. I would love to know how you like reading, what the importance of reading is in your unique life, if you have read and/or would love to read one of these books, how your reading rituals and/or practice looks like and if you’d love to join me on this ‘One book a week’ journey … Looking forward to reading what you’ll be sharing with me. Love and happy reading time! 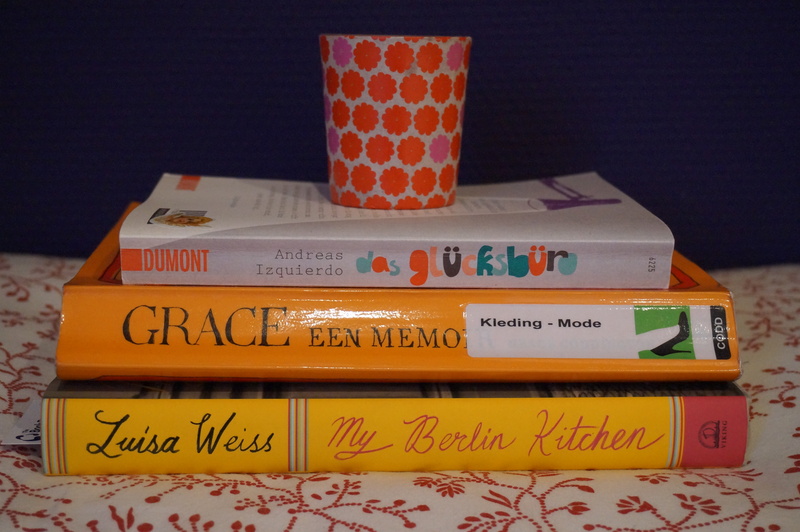 PS: both Pia Jane Bijkerk and Luisa Weiss have blogs. You can find Pia’s here and Luisa’s here. PPS: you could still join me in Stephanie Levy’s Creative Courageous Year course and/or sign up for the winter edition. I’d love to embark on this long year adventure together with you. I love your Book a Week challenge. I used to be a voracious reader and I would like to return to that. I already have so many books to read in my home and on my iPad I will never finish them all but that’s part of the excitement, isn’t it. I too see books as a way to discover the world, both my interior one and my exterior one. I am part of the CCY course for 2014 and look forward to it so much. I lack technological savvy but I am learning. Shall we share here or there or both? This also sums up what I hope to do with the rest of my life. wow, that is a big challenge! But I like it! I also write down all the books I read last year. But it were only 20 in total. But some had about 500 pages. But during the moving time I did not read any book, I only started recently again, but I love to read also! I love your words and thank you for the recommendations. I am not sure I could keep up with a book a week. but then again I read about 4 to 5 books at a time. I can’t wait to hear what other books you have on your stack now. I too am a book lover and always find book stores where I visit. I am reading Beautiful Ruins right now and I love it. Next up will be Wild by Cheryl Strayed. I hope to finish both while I am laid up recovering. But that would mean I need to stay off the computer. Hugs to you.